The Florida Keys reach out through the Gulf and the Atlantic Ocean beckoning for us all to relax and slow down. The very fabric of life in the Keys is woven from many strands of ethnicity and character types, and is then hung between two palm trees, for us all to rest in and enjoy. 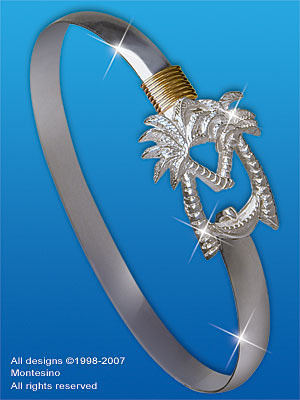 The Marathon "Destination" bracelet has captured the laid back lifestyle of this Island Paradise with an "M" that is crafted of precious metal palm trees, and then strung with the familiar symbol of relaxation, the hammock. The 8 wraps of 14 karat gold represent the 8 square miles of this island that is filled with sun, fun and adventure or..... if you choose to, kick off your sandals lie down in the shade and relax! The Marathon "Destination" bracelet is a symbolic treasure reminding you of your moments in Paradise, no matter how you chose to spend them.